There are some misguided people and trainers out there who think you should not train your dog to understand the word “no”. To me, that is exactly the same as saying you should not teach your child the word “no”. For example, if your child was about to touch a 500° stove, would you raise your voice and say “no!” so they stop immediately and keep from being hurt? Or would you calmly tell them “hey wait I have a cookie – please don’t do that, eat this instead” and by then, it’s too late and they have burned their hand? If your child demands you give him $50, you cannot say “no”? The same thing goes when you’re teaching your dog not to beg for food or attention, cross the street by himself, or eat a piece of chocolate, dead rat, or a pill that dropped on the ground in front of him. He also has to know not to jump on a small child or frail grandmother. He has to know that “no means no” for his own safety, let alone for the safety of others. If you read my pages on methodology, you’ll see that I believe that you raise dogs like you raise kids. You have to set boundaries and have a clear rewards and consequences. Consequences or “punishment” does not mean pain or fear, but it needs to mean that they are not rewarded for poor behavior. Without that, you cannot turn dogs (or kids) around who are misbehaving. You can continue “bribing” them with treats (or, for children, money, toys etc. ), but if they decide that they’d rather misbehave, and they know there are no repercussions, then you have no control over them. There are no bad dogs, just untrained ones! I have helped hundreds of dogs who were people, food, and/or dog aggressive turn around. But I don’t do it with only bribing them to do so with treats. A dog has to learn the word “no” and to understand when they are making mistakes. 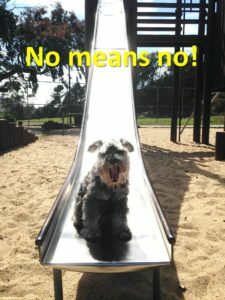 If you don’t want to be able to teach your dog “no means no”, then I won’t be able to help you. After all, If I can’t tell the dog to stop doing something, then why will he stop? But if you decide you are willing to try a firmer hand with your dog, then feel free to give me a call. Here’s a short video I happened to film to show a movie director how I could make Kompis look like she was sniffing around looking for something for a scene. I used the words “no” and “yes” to indicate if she was going in the correct direction. As you can see, there is no fear involved with these terms, just simple direction – ‘yes’ means you did the right thing, and ‘no’ means you made a mistake. Pretty simple stuff! Dogs thrive when given clear boundaries. After all, that’s how they live in nature… Animals are told “no” and “yes” by their parents and pack/flock/herd leaders. They are not given cookies for good work, nor are they given more than one chance to obey. If an animal doesn’t follow the rules, they are quickly corrected or left behind and then “survival of the fittest” kicks in and they are taken out of the gene pool. The animals who listen and follow the rules survive and thrive! 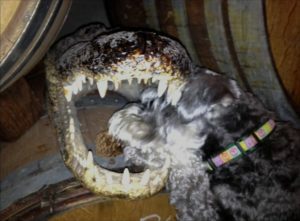 Dogs like to explore everything… But sometimes, you have to tell them “no”!